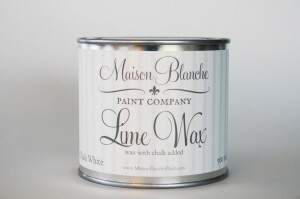 Available in Black, White, and Gray, Maison Blanche Paint Company’s Lime Wax is a premium formulation of pure bees wax, carnauba wax, and Chalk. The addition of chalk to wax creates a unique furniture finishing wax that will impart a semi-transparent, chalky looking, textural layer of color to your furniture piece. Use Lime Wax to give special protection to pieces painted with Maison Blanche Paint Company’s Vintage Furniture Paint. Maison Blanche Paint Company’s Lime Wax will augment the natural beauty of your piece by enhancing the patina and enriching the texture. To Use: Lime Wax is a penetrating wax that soaks into your Vintage Furniture Paint painted surface to strengthen and beautify. No fancy tools or expensive brushes needed to apply Lime Wax. To obtain a natural shine, apply a thin layer using a chip brush or cloth. Let dry about 15 minutes to an hour before buffing with a soft cloth. Follow with a second coat if desired. Please note that Lime Wax is semi-transparent. If you would like to have more shear coverage, apply a thin layer of Maison Blanche Paint Company Clear Antique Wax to your painted surface and allow it to dry completely before finishing with Lime Wax. Alternatively, you can mix Lime Wax with our Clear Antique Wax for a layer of color that is more translucent.